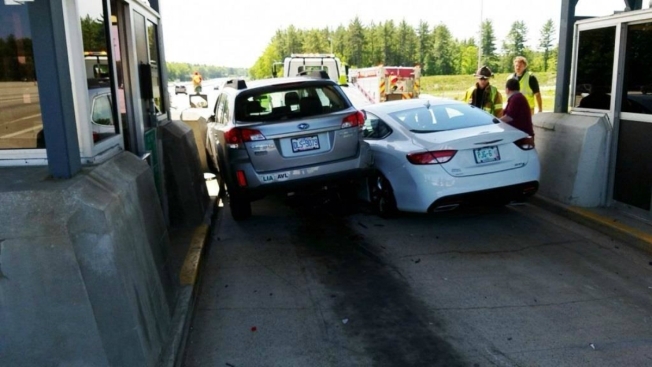 Two vehicles entered the Bedford, New Hampshire, tolls at the same time on Tuesday afternoon. The New Hampshire Department of Transportation is issuing a few sage words of advice to motorists traveling on the state's highways. "Only one vehicle at a time through the toll lane please..." the NHDOT posted on its Facebook page on Tuesday afternoon, alongside a photo of two vehicles squeezed together side by side in a single toll lane. Two motorists entered the same toll lane southbound at the Bedford tolls around the same time on Tuesday afternoon and got stuck there. State transportation officials said no one was injured. The lane was cleared and reopened within an hour.